The snowdrops I ordered from Carolyn of Carolyn's Shade Garden arrived in the mail today. This was an exciting event for me. 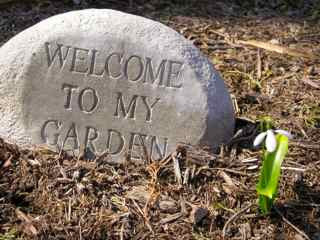 I feel it marks the start of my gardening year! Unfortunately, they arrived on the worst-weather day of this winter. 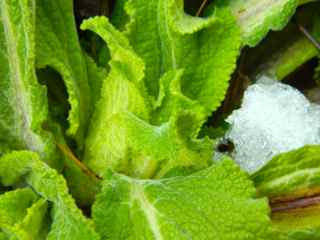 The snow that started early, changed to freezing rain by mid-day, and the cold mess continued into the afternoon. 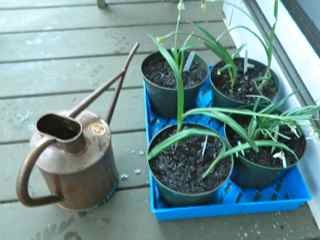 I don't know if the ground is still frozen here, but there was no way I was going to dig around outside to find out, so I decided to pot-up the new plants until the weather improves. I was so happy to get dirt under my nails! It felt like Christmas morning as I opened the well-packed box. I was surprised they still held their sweet blooms. Carolyn had clearly labeled each variety. 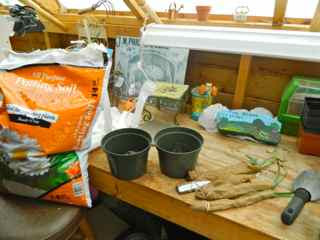 Wearing barn coat, hat, gloves and boots, I headed out to my potting shed with my precious plants. The potting shed is a mess at this time of the year, but it was lovely to be inside my sanctuary again. 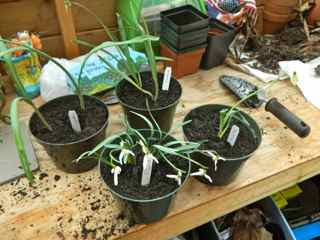 I cleared a bit of space on the potting bench, opened a new bag of potting soil, and soon had four pots of healthy-looking snowdrops! 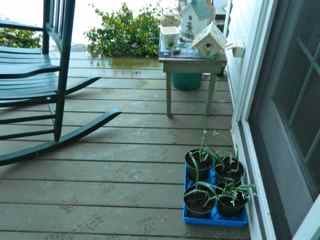 I carried my trophies to the back porch, watered them, and left them there to await their move to their new home (frequently peeping through the window to admire them). 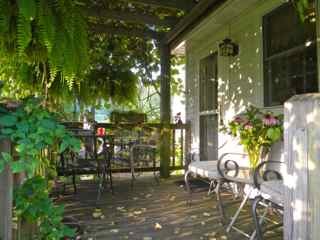 I will plant them in my shade garden where I can see them (through the French windows) from my favorite chair in the garden room. Thank you Carolyn! You made my day! 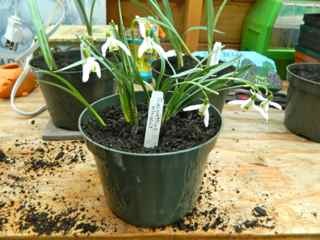 The only snowdrop I owned before today. 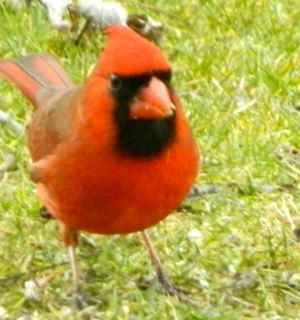 With bird reference books, binoculars and camera, I was so ready for this year's Audubon's Great Backyard Bird Count following my great disappointment last year. I was ready then, too, only to be whisked off to the cardiac unit on the day the Bird Count began. What a difference a year makes. I am totally recovered, thanks to a brilliant surgeon, wonderful hospital care, and the love of friends and family. Time erased some of the horrors, and as I watch the beautiful, winged visitors to my garden, I am making happy memories to replace the bad ones. 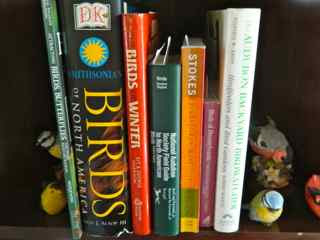 I begin with a set of bird books that I acquired over the years. 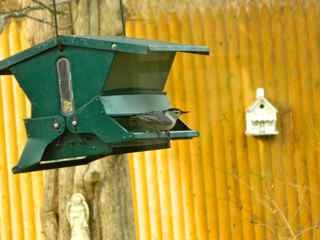 At the end of this posting there is a bibliography of my favorites, and a brief review of the gardening book, Attracting Birds, Butterflies and Other Backyard Wildlife by David Mizejewski. 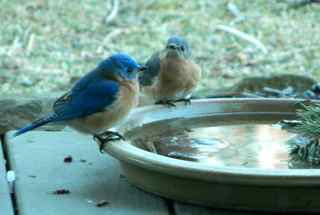 Of course, the bluebirds are still my favorite, and I'm always glad to get new pictures of them. Clockwise from top left: female cardinal, bluebird, cardinal, goldfinch, wren. 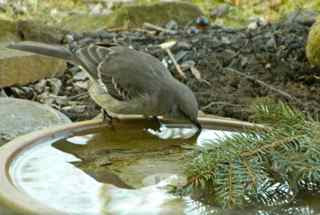 For the Bird Count you need to record the highest number of each species you see together on one day. 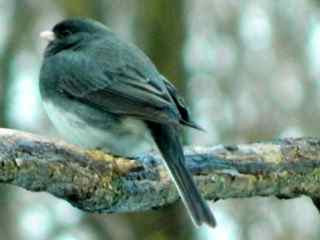 The dark-eyed juncos won in my garden, as I saw as many as nine scratching away under the bird feeder at one time. Dark-eyed junco waiting for his turn at the bird feeder. The American goldfinches came second. They enjoyed the pond, and loved eating the seeds of the purple cone flowers near the pond. I counted seven of them there, but couldn't get them all in a picture at one time. 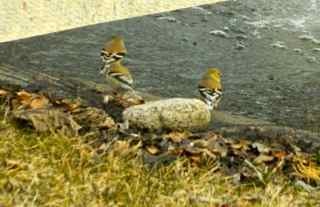 American goldfinches wearing their olive-green winter coats, by the fishpond. 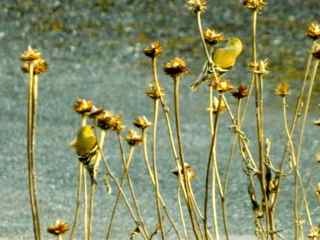 American goldfinches eating the seeds of Echinacea purpurea. 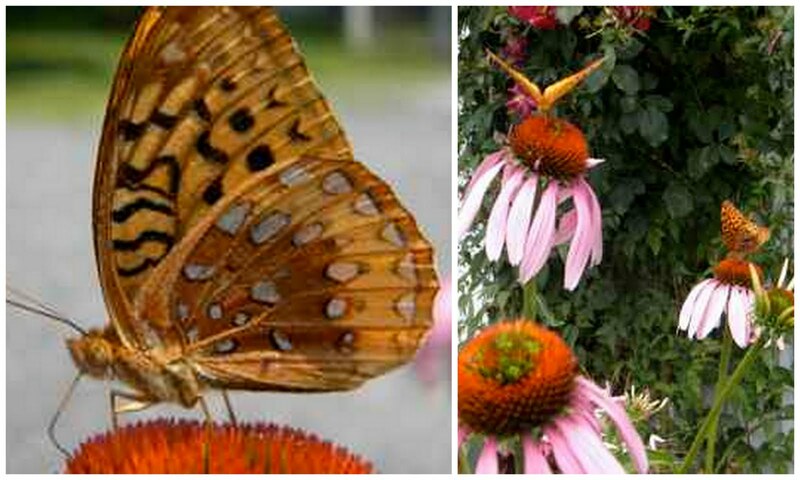 I recently posted about Purple Cone Flowers and you can read about them by clicking here. Time passes so quickly. I can't believe we are in year two of the Eastern Pennsylvania Phenology Project. Reading their blog and mine reminds me how different is this year compared with last. Last year on this date the garden was covered with snow, and the snow had a layer of ice on top, which made walking treacherous. 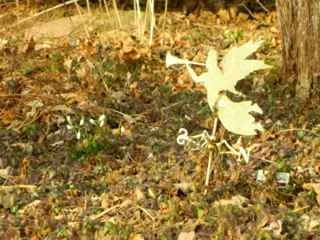 Today, there is no deep snow as I stroll through the Woodland Walk, and am amazed to hear bird song. 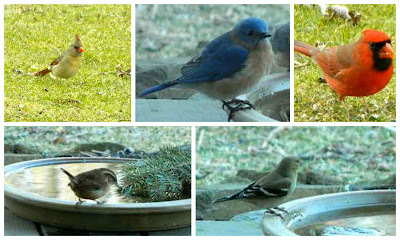 I can identify the cardinal and the mourning dove, but I'm sorry to say I don't recognize any more. 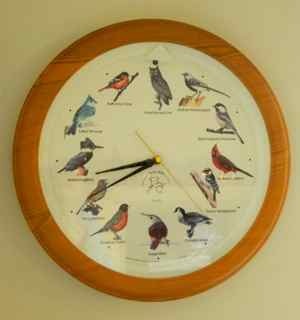 The clock in the garden room plays a different birdsong each hour, but that hasn't helped me, as I can't carry a tune myself. The crows are cawing away, and a red-tailed hawk flies overhead making quite a din. Of course, I recognize the sound of the Canadian geese honking their way north. I count 37 in the flock. H.H. saw three bald eagles fly over our lower field, yesterday. How I envy him, as I have yet to see an eagle. A mile from our house, there is a 'Fish and Pay' lake, and the eagles live on the wooded hill behind it. There are often sightings, but not by me. Again, what a difference the passing of time makes! Last year at this time, there was no visible sign of plant life. 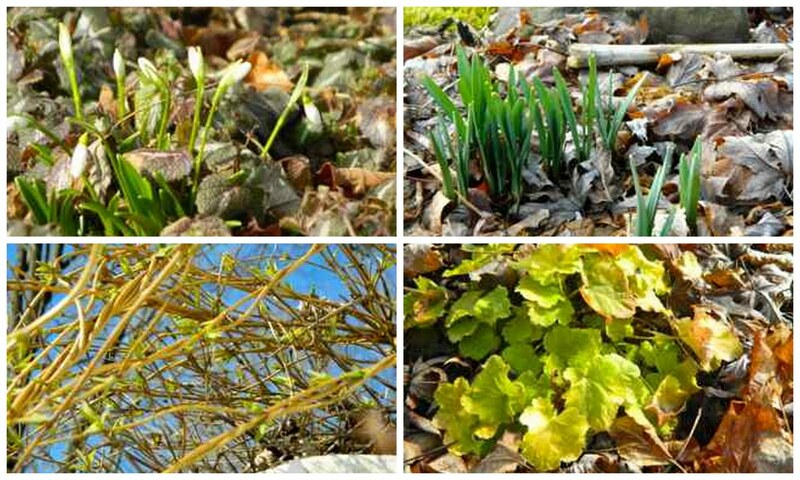 As I walk around my gardens now I find snowdrops, hellebore buds, leaves on the honeysuckle, and I spot the green of ferns and foxgloves. The angel blows a fanfare to herald the emerging snowdrops. Clockwise from top left: snowdrops, daffodils, heuchera, honeysuckle. A dusting of snow in the Woodland Walk and top field. Hellebore buds. I didn't recognize him immediately -- good thing I have my trusty collection of bird field guides. 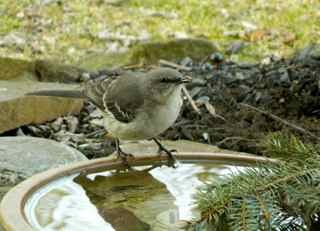 The Northern Mockingbird can stay in the northeast all year, but usually winters further south, so I was very excited to see him here today. What a wonderful ending to the Bird Count. 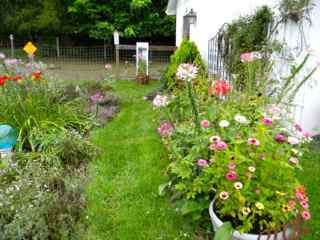 I am linking this posting to Donna's Word 4 Wednesday at Garden Walk Garden Talk. The word this month is TIME. 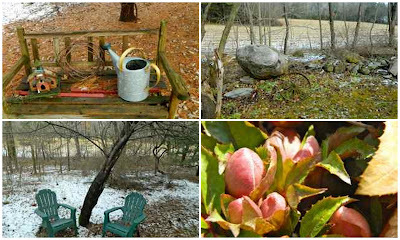 And to Holley's Garden Book Review at Roses and Other Gardening Joys. Be sure to check out these two wonderful blogs. Think spring! It wont be long now. This book was produced by the manager of the National Wildlife Federation's Backyard Habitat Program. USA TODAY Magazine says, it "...describes in full and fascinating detail how to get the varied citizens of Mother Nature to set up shop on your property ..." It teaches how to restore wildlife habitat in your own yard, by providing the conditions that birds and butterflies need to thrive. 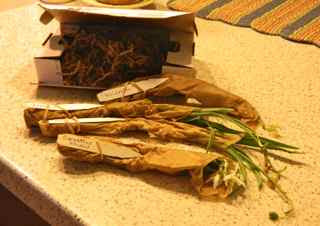 Reintroducing native plants is key. The book includes several fun projects for the whole family. The wildlife photographs are outstanding!! Birds: Eastern Region. National Audubon Society's Field Guide. Field Guide to Birds: Eastern Region by Donald and Lillian Stokes. I recommend all of these books. I like to use mirrors in my garden. They just seem to double my enjoyment of beautiful blooms. Last year I placed one in the kitchen garden behind the perennials that I grow there. 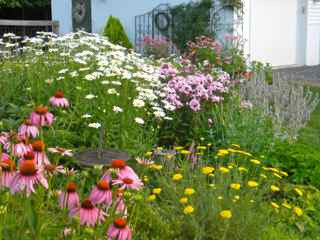 I plant perennials and annual flowers near my vegetables to encourage pollinators. 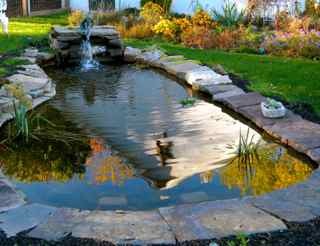 Mirrors in the garden, like those inside your home, make the space seem bigger. As well as purple cone flowers and delphiniums, the mirror reflects the raised vegetable beds. 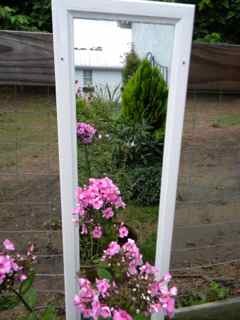 I attached another mirror to the ugly, pasture fence to reflect a bushel basket filled with pots of phlox. The reason the phlox plants were in pots, and not in the ground, was because I was plant-sitting them for a friend -- the bed they were to inhabit not being ready. 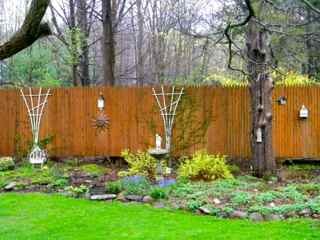 I am always looking for some way to hide that ugly fence. 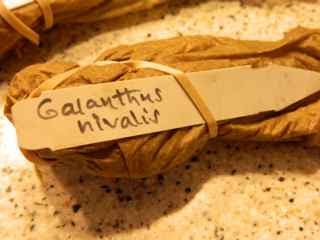 It is a necessary evil, needed to fence-in the horse and goat. Someone once suggested I disguise the fence with a pretty vine. She obviously doesn't know that goats eat anything and everything! I make sure the phlox are not reachable by little nibblers. The pasture-fence mirror provides a focal point at the end of a grassy path. Phlox are beautiful, but not my favorite, being prone to powdery mildew. 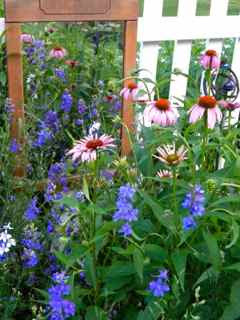 I confess, however, I have a special love for Echinacea purpurea purple cone flowers. 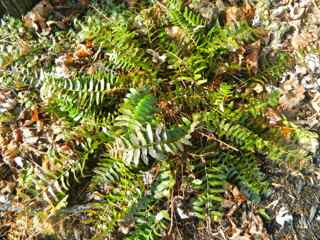 I am choosing them as my second signature plant -- my first was English bluebell. 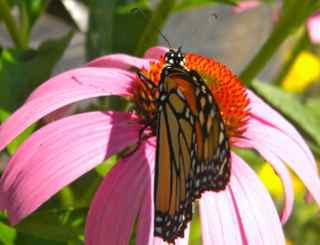 In my endeavors to create a wildlife garden, I find the purple cone flower has an amazing ability to attract birds, butterflies and bees. Furthermore, they have a long season of interest. Loved by butterflies in the summer; in the fall their seeds are prized by American goldfinches. 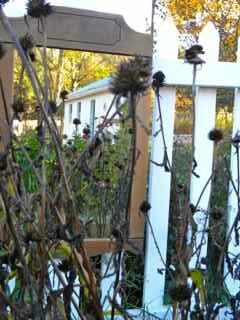 Reflection of the seeds of the purple cone flowers in autumn. 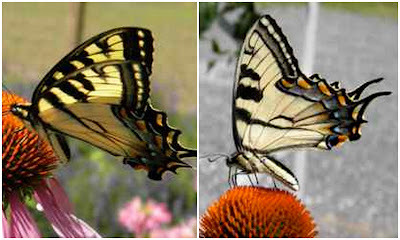 American swallowtail butterflies on purple cone flowers. Fritillary butterflies on purple cone flowers. 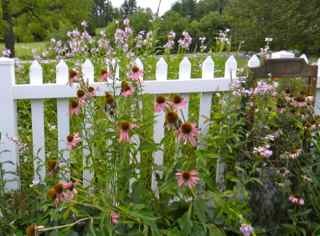 I planted purple cone flowers liberally throughout my cottage gardens. 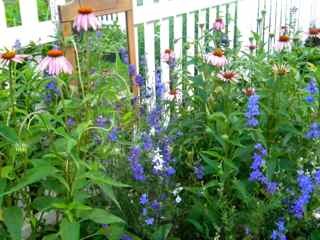 A vase of purple cone flowers adds color to my shady deck. 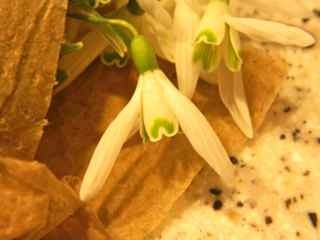 Today, I am linking to Diana at Elephant's Eye with my February pick for my signature flower. Also, I am making a very belated link to Donna at Garden Walk Garden Talk, who wrote a great post, and inspired other wonderful postings, with last month's Word for Wednesday, 'Reflection'. 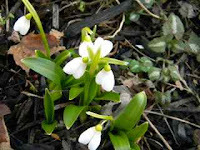 Please visit Diana's and Donna's blogs -- you will be glad you did! 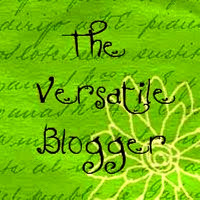 I would also like to thank three great blogger friends for awarding me the Versatile Blogger Award. They are Bumble Lush, Donna at Garden's Eye View, and Julia of Polka Dot Galoshes. While I am not following the award rules, I am truly honored to have been nominated, and thank them sincerely. I recommend that everyone reading this posting go over to their must-visit blogs. 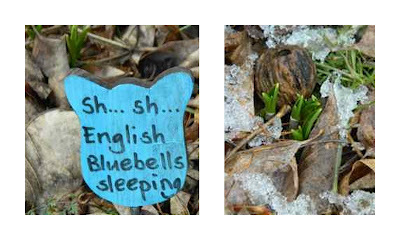 Garden bloggers are the best! Autumn reflections in the pond.